Slow-release carbohydrate foods -- carbs that are absorbed slowly and keep your blood sugar steady -- keep hunger pangs away and help prevent chronic diseases, such as Type 2 diabetes and heart disease. By contrast, carbohydrates that are absorbed quickly -- such as white bread, hamburger buns, cookies, donuts, candy, french fries and most breakfast cereals -- are absorbed rapidly, causing sharp spikes and dips in your blood sugar that make you hungry a short time later and set you up for health problems. Feel better and stay healthier with slow-release carbohydrates. 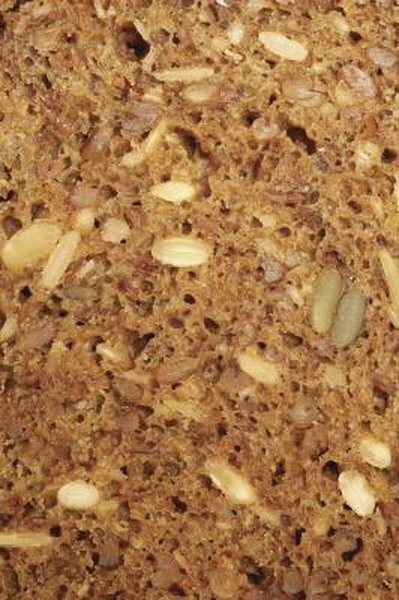 Your body digests whole grains more slowly than refined grains, which have been stripped of their bran and germ, and thus fiber, and are absorbed almost as quickly as pure glucose. Whole grains -- barley, oats, brown rice, wild rice and bulgur -- and products made from whole grains, such as whole-wheat breads, bagels, pasta and crackers, and 100 percent bran cereal -- provide a slower, more sustained source of energy that keeps your blood sugar stable. Quickly absorbed, refined carbohydrates are linked to Type 2 diabetes, heart disease and weight gain, notes the Harvard School of Public Health. Whole grains may decrease your risk of these conditions. Most fruits and vegetables are slowly absorbed carbohydrates that have minimal effect on your blood sugar and insulin levels. Eat dark green vegetables, such as spinach, kale and broccoli; and orange vegetables, such as squash, pumpkin, sweet potatoes and winter squash. Vegetables that are quickly absorbed include white potatoes, corn and parsnips. Whole fruits are preferable to fruit juice, which is absorbed rapidly due to its lack of fiber. Not only are beans an excellent source of slow-release carbohydrates, they're also a good source of protein and fiber, which slow the digestive process further. Beans -- like whole grains, and most fruits and vegetables -- have a low glycemic index, a measurement that gives information on how a food affects blood sugar and insulin levels. Include lentils, garbanzo beans, black beans, pinto beans and other beans in your diet for sustained energy and reduced risk of chronic diseases like Type 2 diabetes and heart disease.